L'AirLink MP70 est un routeur de véhicule LTE-Advanced de haute performance développé spécifiquement pour les applications critiques dans les services de sécurité publique, de transport en commun et sur le terrain. Offrant une puissance élevée, une connectivité Wi-Fi Gigabit longue portée et Gigabit Ethernet et des vitesses descendantes allant jusqu'à 300 Mbps sur LTE-Advanced, l'AirLink MP70 associe la flotte au réseau d'entreprise et permet à de multiples applications de fonctionner simultanément, plus loin et plus rapidement depuis le véhicule plus que jamais auparavant. Le MP70 prend en charge une visibilité à distance avancée et un aperçu instantané du réseau de véhicule (VAN), des applications de terrain et des actifs, ainsi que de la main-d'œuvre mobile. Module construit pour le véhicule, le MP70 offre une fiabilité supérieure et un fonctionnement ininterrompu dans les environnements mobiles difficiles. 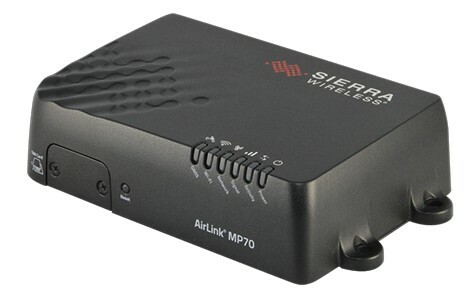 The AirLink MP70 supports 21 LTE frequency bands, enabling superior coverage on LTE networks worldwide. With automatic configuration of the radio based on the SIM, the AirLink MP70 has two product variants—one for LTE networks in North America, Europe, Middle East and Africa, and another variant to support all major LTE networks in Asia Pacific. Utilizing next generation GNSS location technology that supports 48 satellites from 4 different satellite constellations (GPS, GLONASS, Galileo, Beidou), the MP70 provides fast, reliable and precise vehicle location, even in the most challenging environments. The MP70 contains an Inertial Navigation System 1 that allows it to track without satellites, using dead reckoning algorithms integrated with the GNSS. The Inertial Navigation System continues to provide positioning information when the GNSS is unable to acquire satellites. This enables tracking through urban canyons, tunnels and underground parking. Location information can be streamed from the GNSS locally over the serial port to connected in-vehicle driver navigation and dispatch systems, and remotely over NMEA, TAIP, RAP and XORA protocols for integration with 3rd party applications. The AirLink MP70 safeguards vehicle operation by using built-in battery charge protection to monitor ignition state and battery voltage and, with a class leading power supply which meets and exceeds the requirements for E-Mark, ISO 7637-2 and SAEJ1455, the MP70 requires no additional power conditioning. Developed with industrial grade components, the AirLink MP70 has a customized die cast aluminum housing to manage the thermal output from its high performance LTE-Advanced and Wi-Fi radios. The MP70 is designed to meet IP64 for resistance to dust and water ingress, and is tested to meet and exceed the MIL-STD-810G specifications for shock, vibration, temperature and humidity. The AirLink MP70 provides consolidated data security for all field applications and mobile assets in the vehicle area network (VAN). Offering up to 5 concurrent VPN sessions, the AirLink MP70 enables secure communications to multiple back-end systems, and provides remote authentication management to allow the implementation of enterprise-grade systems to control access to devices in the field. Secure signing and authentication of software images offers end-to-end protection of the software upgrade process, protecting the MP70 against unwanted malware. Network Management solutions for the MP70 allow over-the-air registration, configuration and software updates for all AirLink gateways and routers, and can be deployed either as a hosted cloud-based service, or as a licensed software platform in the enterprise data center. Both options provide a centralized and remote view of an entire vehicle fleet and enable simplified management, control and monitoring of connected MP70s, field applications and mobile assets. AirLink Management Service (ALMS) is a secure, centralized cloud-based service that remotely monitors and manages signal strength, network technology and location. ALMS provides dashboards with up-to-date views of an entire deployment, and custom alerts to monitor and report critical events, to increase efficiency and prevent downtime. oMM Management System (oMM) is a licensed, unified software platform which can be deployed in the enterprise data center, and provides a consolidated network view of an entire fleet, using a virtual dashboard to monitor, report, manage, and troubleshoot all mobile resources as required.